This post is sponsored by Juicy Juice. Thanks for reading! You already know how much The Tiniest Tatums love Juicy Juice (remember this post? ), but did you know how simple packing kids lunches with leftovers can be? If your kids are anything like mine, they love tacos! They’d probably eat them for breakfast, lunch, and dinner if I’d let them. Last Christmas, I kid you not, we had tacos for dinner. Combining their favorite foods with the convenience of a homemade lunch is a win-win situation for any Mom. Gather your ingredients and get excited because this is the easiest lunch you’ll make all week. Our lunch starts with leftover pulled pork (which we made in the Instant Pot the night before – a lil’ Mom hack!). Then we added shredded cheese, corn, and lettuce. Of course this lunch isn’t complete without some Juicy Juice! I’m loving the Orange Tangerine Juicy Juice, and the little ones are, too. This is where the kids can really make lunch their own. Beak up the tortilla bowls and mix all the ingredients together to make a taco salad, or layer the ingredients individually in the bowls. Either way, they’ll enjoy every bite! If your kids really like lettuce, you can stuff extra lettuce in. If they aren’t huge fans of corn, you can leave it out. The goal is to create a healthy, delicious lunch they will truly enjoy. Mamas, you probably have tons of ideas swirling in your head already to make this lunch perfect for your kiddos: shredded chicken, beef, or even turkey with chips or crackers would be a great option, too. 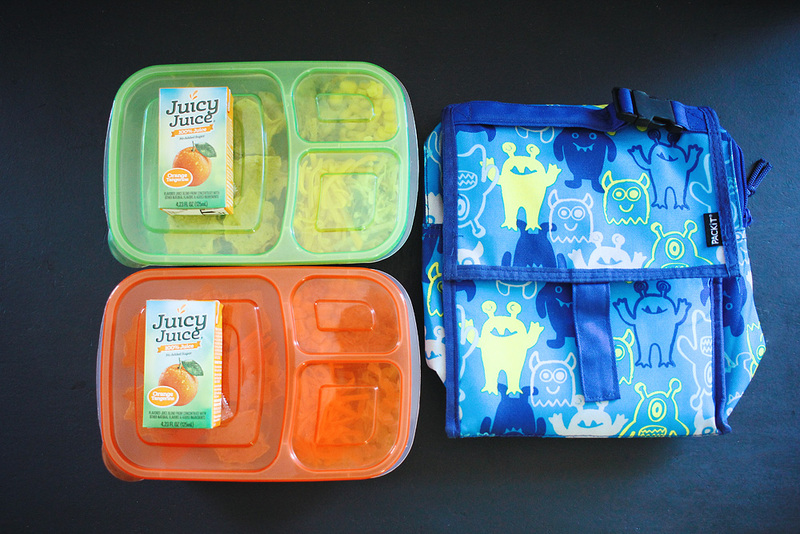 No matter how you decide to switch the lunches up each day, be sure to include Juicy Juice to keep everyone happy; Juicy Juice really completes the meal! How do you keep lunch fun, without adding a ton of work to your workload? Dinosaur-shaped sandwiches, maybe? Let me know in the comments… I’d love some ideas to add to my stash! Oh I love these! I’d much have preferred something like this for lunch when I was little. I had to make do with jam sandwiches. Thanks for this. Forget the kiddos! I want this for myself, with bigger portions naturally. I love those containers tho! You stay bringing the good stuff! This is such a fun lunch. Would be helpful when my kid starts his school. Thanks for the idea. My kids would seriously love to get this as a lunch! Such a great idea. 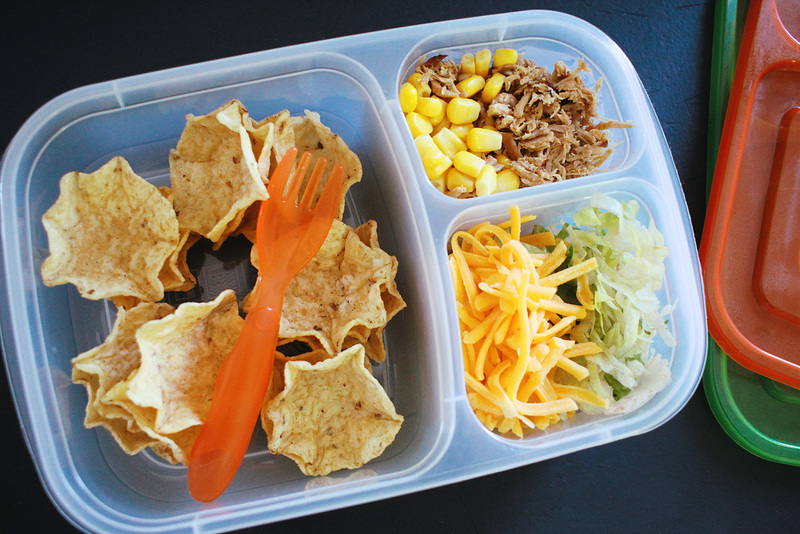 Omg this lunch box idea is genius! Id have loved to have my own taco bowls for lunch growing up. I should make an adult version of this for my lunch tomorr. I’m all over this idea for the kiddos! These look cute and fun. It’s just as good as a lunchable, but with more nutritional value. This is like your own lunchables. Why didnt they think of making tacos when we were kids. This is smart and fun for kids! My kids would love these! We pack lunches everyday and this has so much better nutrition than a sandwich! What?! That’s so cool. And I love the lunch boxes as well. I have to buy some myself. The mini taco bowls look so good! The recipe is so easy to do as well. What fun and fabulous children’s lunches! Such a great idea to incorporate Juicy Juice boxes. I love that these are 100% juice and so convenient! This is a lunch idea I know my Son will love. I will have to get the ingredients I need to make this next week. Wer just did tacos for dinner the other night, and this is a perfect way to use up leftovers! I’d actually do this for myself, not just the littles! Haha! I have some super picky eaters, but they like tacos. I would have never thought to use cold pulled pork in a school lunch, but I eat it in salad all the time, so I know it’s yummy. Thanks for the great idea! Pinning. What an awesome lunch idea! I am always struggling to come up with ideas besides the same old boring sandwich or homemade punchable! Def going to surprise the kids and send this sometime this week! Just hope they don’t throw away my tubberware like usual ugh! Girl, I want to come have lunch with you everyday!! Seriously, I could use the pointers that you have here for your kids for myself. This would be such a fun lunch! I’ll have to do this for my daughter sometime. She’d get a kick out of it. Plus, we love our tacos!